The City of Hampton, established in 1610, has its roots as America's first continuously occupied English-speaking settlement. That year, the settlers founded St. John's Episcopal Church, which remains the country's oldest Anglican church. With a population of about 140,000, the city's location has the advantage of being midway between two Hampton Roads tourism meccas -- Williamsburg and Virginia Beach. Hampton is well known as the home of NASA Langley Research Center, the Hampton Coliseum concert venue and Hampton University. Regionally, the city provides shoppers with the new Peninsula Town Center, the Peninsula's largest; major entertainment events such as Hampton Bay Days and the Hampton Jazz Festival; and sports draws including NASCAR races at Langley Speedway and the Hampton Cup Regatta. Locals know about the city's more subtle charms: several beaches that remain relatively uncrowded, the beautiful downtown waterfront, and the historic area of Phoebus, newly streetscaped to highlight the quaint shops. On the Chesapeake Bay, Buckroe Beach is a local favorite for sunbathing, swimming, and fishing. The nearby Grandview Beach at the Grandview Nature Preserve has over two miles of beaches in a 578-acre preserve and estuary. 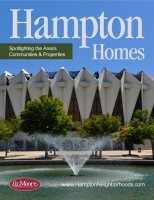 Hampton has continued to focus on projects to revitalize its downtown area, where the Virginia Air and Space Center, with more than 100 historic, aeronautic and space exhibits and a giant IMAX movie screen, draws about one-quarter million people each year. The historic Phoebus area boasts the 400-seat American Theatre. This venue was recently renovated to reflect its original 1912 d�cor - featuring internationally renowned performers. The city boasts a strong military and technology presence. Fort Monroe, established in 1819, is headquarters for the U.S. Army Training and Doctrine Command. Langley Air Force Base is home of the First Fighter Wing. NASA Langley Research Center, where America's first astronauts were trained, is now a major center for aviation research. Technology centers of employment include companies such as Gateway 2000, Howmet Corporation, Computer Sciences Corporation and Nextel Communications. The city is home to Hampton University, a private school on the city's waterfront offering numerous bachelor, master and PhD. programs, as well as Thomas Nelson Community College, a two-year institution offering associate's degree curricula. What Will We See in the 2019 Peninsula Real Estate Market? Liz Moore & Associates agents have something very special in common...we're passionate advocates for this fabulous place we call home! That's why we have collaborated on our favorite reasons for loving the community where we live, work and raise our kids. Download our list of reasons to love living in Hampton...and next time you're looking for a new weekend adventure - or entertaining out-of-town guests - check out one of our local favorites you've not experienced before! Introducing the Liz Moore Digital Magazines!